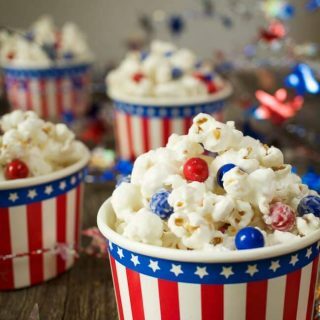 3 Ingredient Candied Popcorn recipe that is a quick and easy to prepare snack, that is so versatile that you can customize it for any occasion! This 3 Ingredient Candied Popcorn snack recipe is so easy to make and so versatile. We were invited to a July 4th party, and I knew that there would be a lot of children there. I wanted to make something that both children and adults would love. 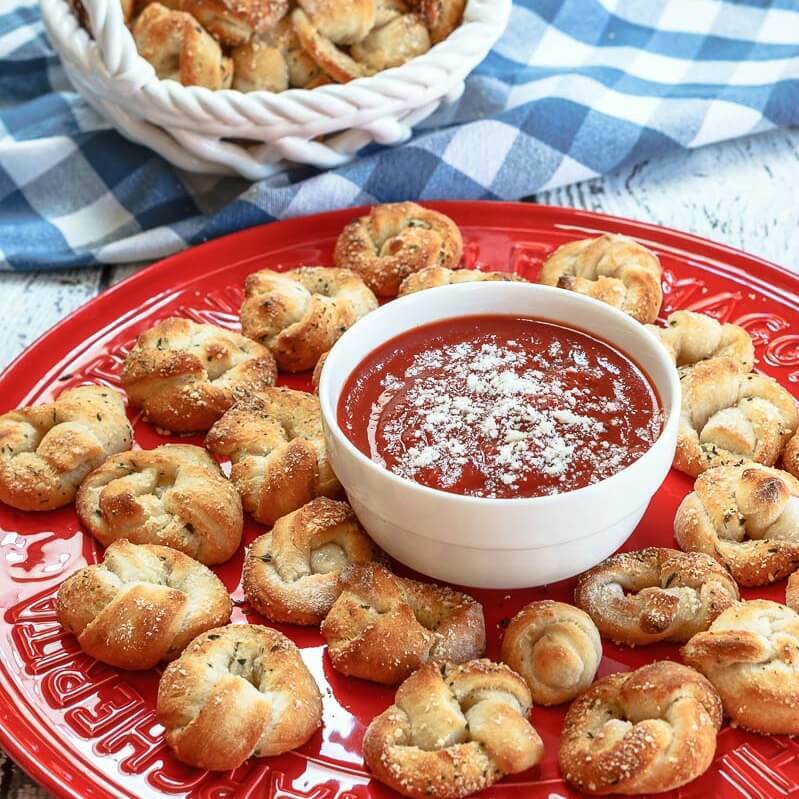 A lot of times, we make appetizers for our friends, and don’t think of the kiddos. 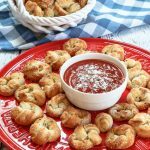 For this special occasion, I brought this quick and easy to prepare snack, that is so versatile that you can customize it for any event. It is so delicious, that I’m going to have make another batch. We are celebrating The 4th of July here in the States which is also called Independence Day. Red, White and Blue are our country’s flag colors, and the colors that we use to symbolize this Holiday. For this snack, I used white almond bark as my candy coating. You could use any melting candy coating such as white chocolate chips or candy disks. I also used red and blue chocolate candies. 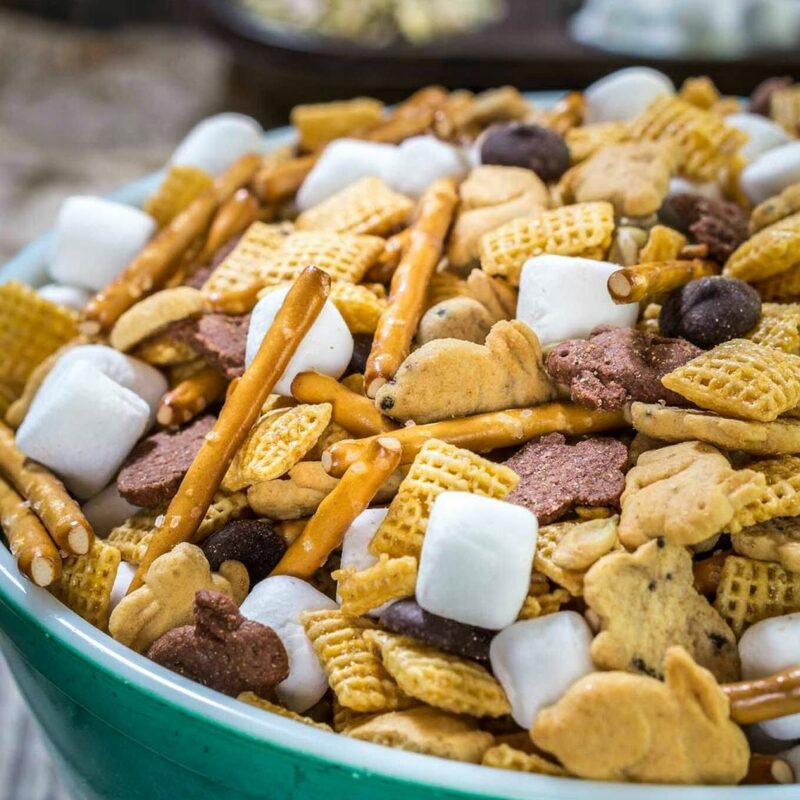 You could add peanuts, pretzels, or any kind of candy that you want. You could also just use colored sprinkles or sugar instead of the candy. I mixed just the popcorn with the melted almond bark and then added the candy. By then the candy coating had cooled a bit and didn’t melt my chocolate candy. I turned the mixture out on a pan to set, and pressed the remaining candy onto the top so some of the candies would stay shiny. You can pop your own popcorn, but I bought a twin pack of popcorn that was 11.5 ounces, so I doubled the recipe. This treat didn’t last long. Every time someone ventured by the bowl, they would grab a scoop. I wasn’t staring but wanted to make sure I had a couple of scoops for myself. 3 Ingredient Candied Popcorn recipe is a quick and easy to prepare snack that is so versatile that you can customize it for any occasion! Put popped corn into a large bowl. Melt candy coating according to package directions and pour over popcorn and stir to combine. Add 1/2 of candy pieces and stir to combine. Pour onto a jelly roll pan, lined with waxed or parchment paper. Sprinkle and press remaining candy pieces over the top. Allow the coating to set. Can be chilled in the refrigerator to expedite setting. Break up and serve, or place in an airtight container. 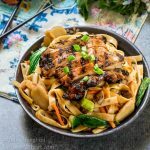 If you are still looking for great make and take recipes, here are a few of my favorites! Thank you! It is addicting! Thank you so much Lindy! I appreciate you hosting us this week and hope you had a great time. How delightful! I love the colors and this is such a great idea! It’s always nice to have something for the kids! Thank you, Antonia! Perfect for the kiddos and they can stuff whatever they want in it too. These are some of the most beautiful 4th of July pictures I have seen! They just jump off the page! (I wish the popcorn really would jump off the page and into my mouth) 🙂 I love that whole salty sweet thing. Pinning for sure! Thank you again! You know when you get a bit of real sunshine, it can really make a difference with the pictures. This popcorn was so easy and delicious. I made my husband take it to work. My hips couldn’t take anymore! It would be great to set out when entertaining though. I’m a tad late Julie…..so I hope you’ve saved me some of this delicious candied popcorn. You’ve really made it sparkle and pop for the holiday haven’t you? Yummy!! Thank you Loretta! I’ll make you a whole new batch! This is a yummy concoction. 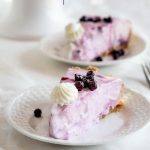 I had to tell my husband to get it out of my site. I was too weak to resist munching. I’m afraid that I would probably do more snacking than card playing! I had a great time co-hosting. This is such a wonderful group of people. It looks like you had an enjoyable weekend too! Not when we are playing euchre – especially the guys 🙂 They can easily multi-task! Claudia it is addictive! 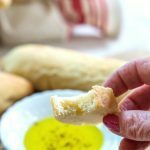 I made my husband remove it from my presence! 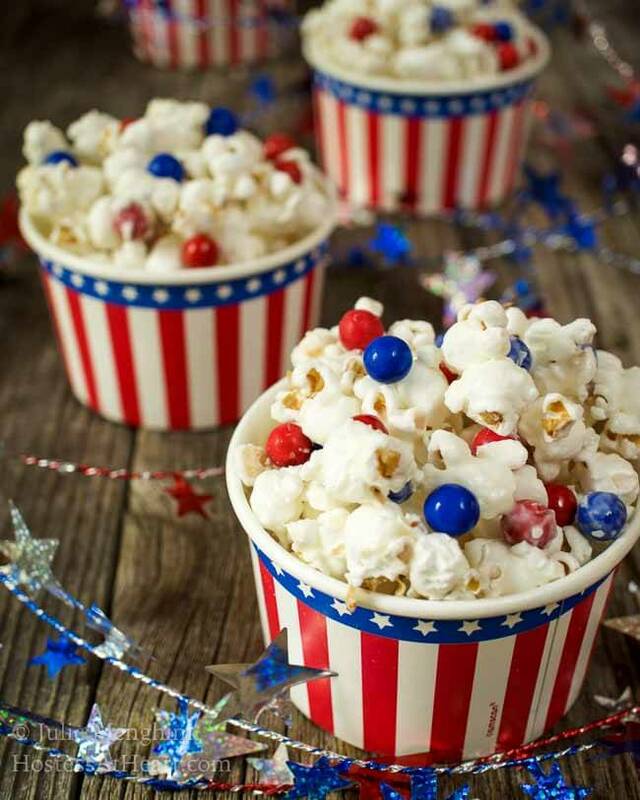 I love your popcorn, they have a completely playful appeal and with such perfect July 4th colours! 🙂 Yum! Thank you Petra! You know, I was so amazed that the almond bard did not weigh the popcorn down. It was so light and fluffy, and the almond mark just left it sweet. There is so many things we could do here. Thank you! It has been a lot of fun with all of the festive dishes. Thank you Jewels! I just love all of the recipes that I’ve seen this weekend. They are adorable Julie! Happy Independence Day and happy Fiesta Friday as well! Thank you Margherita! I hope you are enjoying your weekend! Thank you so much! I really appreciate your stopping by, and hope you had a wonderful experience with FF! It is one of the best group of people I have ever come across. They are so good about commenting and many of us have become friends. I hope you will have the same experience! Happy FF Julie, what an awesome weekend to host your first one! Extra party time! Thank you Michelle! Loved that you reached out on Instagram too! This popcorn is very yummy and the almond bark doesn’t make the popcorn heavy. It says light and doesn’t stick in your teeth like the caramel varieties. I am having a great time co-hosting and it’s been a great weekend. Hope yours is as well. Thank you Dawn! I hope you are enjoying your holiday weekend! Thank you! It was really easy, and yummy. I am all about fun and simple too! Hope you are enjoying your weekend! Thank you Ranjana! Put the whole bowl on your lap and you will have more friends than what you want. I took it to a party and it was a hit with the adults and kiddos. Enjoy your day and thank you for stopping by! Happy fourth of July & Happy FF Julie!! 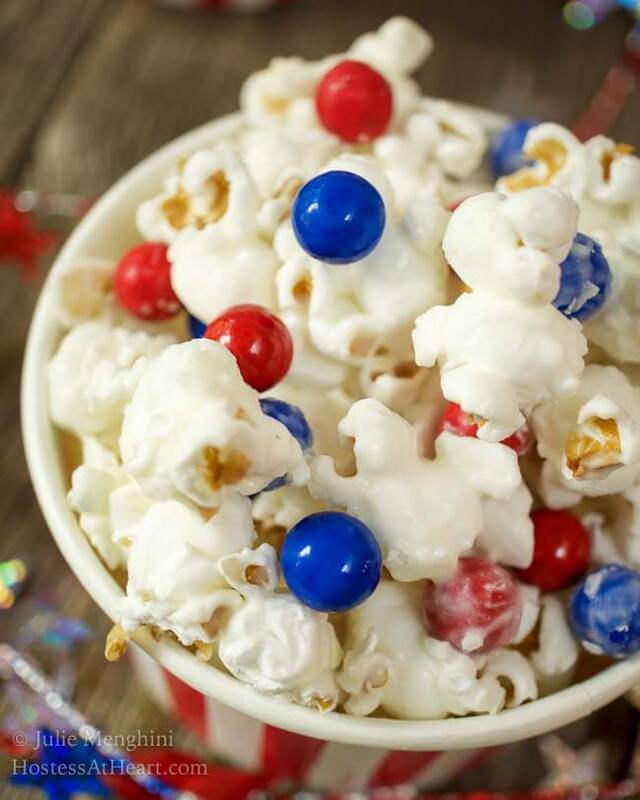 That popcorn looks so festive and delicious! Love those serving cups!! 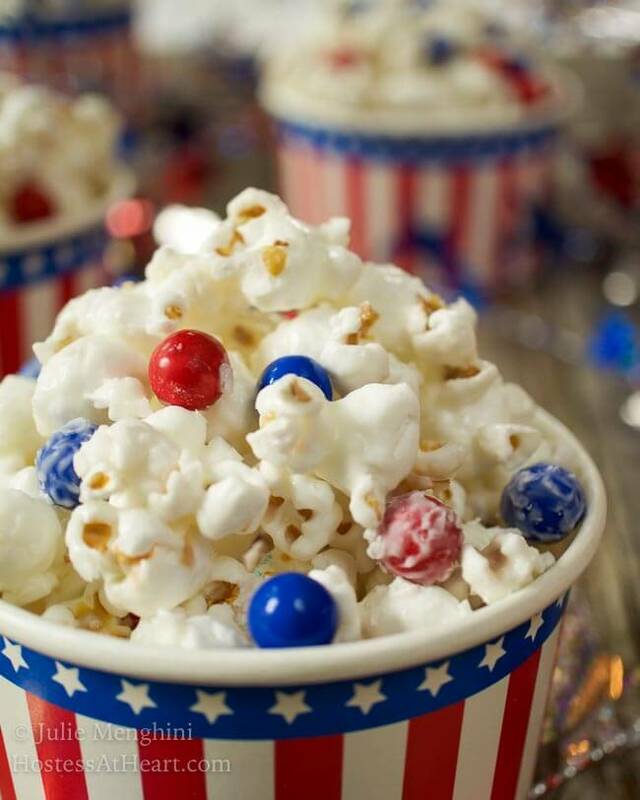 What a gorgeous and simple snack for the 4th of July weekend. This would be perfect for any party. Thank for sharing at FF#75! Thank you Lily! 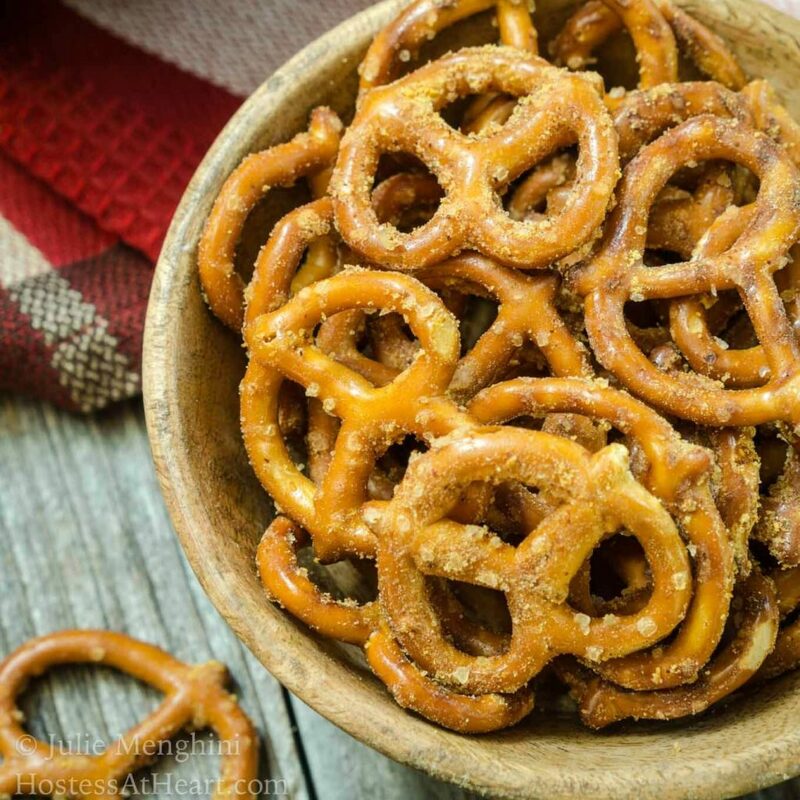 It is so addicting and doesn’t stick to your teeth like caramel and stays light and fluffy. Thank you Chitra! Princess will love it especially with pretty sprinkles! Thank you! What a fun Fiesta Friday right? Enjoy the rest of your weekend! I agree skd! We are definitely in the partying mood. Something about a 3 day weekend make for a great day. Hope you have a happy 4th too! Popcorn and candies together in one bowl?? This is a kid’s dream come true!! 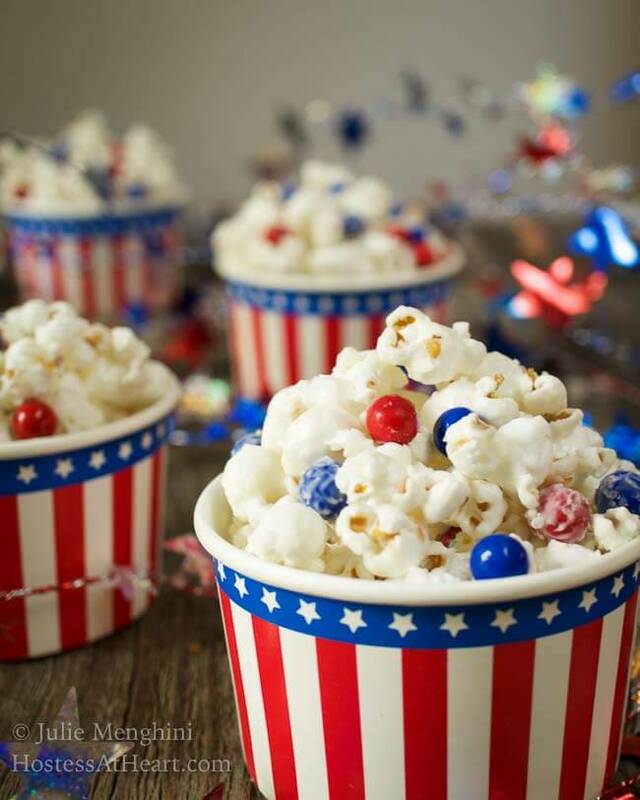 A perfect snack for the 4 th of July celebrations!! Happy 4 th of July and FF!! Thank you Suchitra! Any kiddo would love this, but I have to admit that my little fingers enjoyed it to! Have a wonderful 4th yourself and Happy FF too!